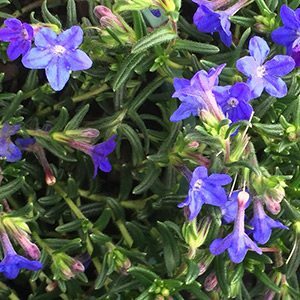 A wonderful blue flowering plant from the Mediterranean, Lithodora diffusa ‘Grace Ward’ is widely used as a ground cover plant. through into summer. The foliage is a deep green, dense and mat forming. This is a plant that likes an acidic soil and good drainage so it grows well in many Australia soils. Best in full sun and best in a frost free position. It can be used as a ground cover, for underplanting taller shrubs, or grown in a container. Although it will spread, it is slow and does not seem to be a problem in the garden. Also useful near the front of the perennial border. This is a low maintenance easy care plant once established. Ensure that drainage is good and you will have very few problems. During long dry periods, some supplementary watering will be required. Best grown in part afternoon shade in warmer climates. Soil – Well drained and slightly acidic. Lithodora diffusa ‘Grace Ward’ can be pruned back after flowering to maintain a more bushy compact shape if required.